Construction of three solar power plants helps local economies. 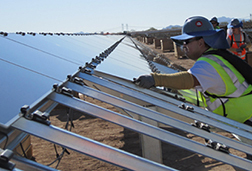 Good news from AZ Sun: APS’s solar plants have reached their peak of construction activity for 2011, and have achieved such efficiency that the first plant will begin servicing APS customers by mid-July, more than two months ahead of schedule. Through the AZ Sun program, APS will develop 100 megawatts (MW) of solar plant capacity across Arizona. Three of the projects, totaling 50 MW, are under construction. APS will finance, own and operate these plants, which are being constructed by third-party solar developers, contractors and equipment providers. The full 100 MW, representing an investment of $500 million, will be developed by 2014. The first of the plants is the 17 MW Paloma Solar Plant in Gila Bend. Built by Tempe-based First Solar, the plant will be the largest photovoltaic plant in Arizona when completed in September. Senior Project Manager Dennis Raber oversees the project for APS. Cotton Center, another 17 MW plant in Gila Bend, is expected to be in-service by November. Sam Ortega, senior project manager, directs this project that’s being developed by the SOLON Corporation. About 40 miles east of Yuma, the Hyder plant will generate 16 MW, and will come online in two phases, the first this October, the second in March, 2012. This plant is being developed by Sun Edison. Engineering Supervisor Ted Tindall runs the project for APS. APS also has contracts for two additional AZ Sun projects, a 14 MW plant at Luke Air Force Base and a 19 MW facility in Chino Valley, north of Prescott. Both are still in the permitting and planning stages. At the Paloma plant in Gila Bend, there are currently more than 300 people working on-site to construct the plant, most of those hired locally. Additionally, the plant purchases many of its construction supplies and equipment from local vendors, and the workers patronize local businesses, from gas stations to restaurants and hotels. Experts say the total indirect benefit to the local community from a solar plant of this size can approach $20 million per project. The plants also generate increased property taxes over the life of the facilities. Turning vacant or agricultural land into a utility-scale solar plant means the land is taxed at a higher rate. That translates into more money available for area schools and other government services. Another benefit that’s more difficult to estimate, but is potentially very valuable for a local community, is the ability to attract other solar developers and manufacturers. A large solar plant can give an area a solar-friendly image, and create a positive halo effect. Other solar providers see that activity and know the local leaders understand how to deal with solar. They also assume there’s a workforce that’s experienced working in the solar arena. So all told, in addition to a new, sustainable energy source which helps ensure Arizona’s energy future, the AZ Sun program’s solar plants will contribute to the financial well-being of a number of small communities around the state. Through direct expenditures, increased tax revenues and the potential for expanded solar-related business activity, these plants will brighten the future for these communities and the Arizonans who live in them. Under a 15 month contract with APS, I wrote for the company’s daily intranet news publication, Inside APS, and served as an internal communications consultant for a variety of APS departments. This intranet article was written to inform the company’s 9,000 employees and contractors about the progress of its solar power generating plant initiative, AZ Sun.